Billy Lynn’s Long Halftime Walk offers an emotional ride to the viewer that can’t be ended with dry eyes. The flashbacks plays a crucial part as we find a 19-year-old Billy, full of dreams, fighting for his great country. Upon return, Albert helps them to participate during the break of a Super Bowl, where Destiny’s Child is about to perform. In the meantime, renowned filmmaker Norm (Steve Martin) has an idea to make a film about the Bravo Squad, Billy and his mates not so eager to go through with that. While Billy attends the Super Bowl and travels back in time to revisit the horrifying day where he loses his mentor, friend and hero, Shroom, he starts realizing his own purpose during his halftime walk…. The Life of Pie and Brokeback Mountain maker Ang Lee this time tackles relevant, yet a sensitive subject matter for the Americans. 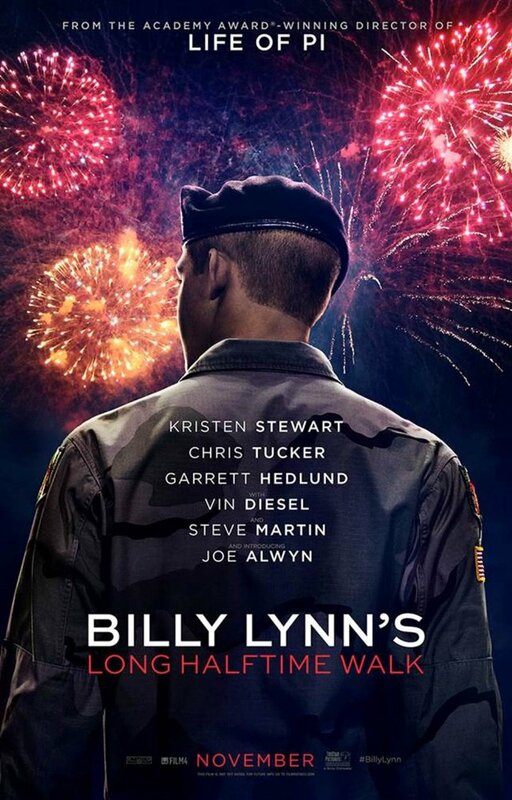 This soulful and delicate movie gives an excellent look into the Bravo Squad, Billy’s personal perspective of the war and his sister who does not want to give up without a fight. The post-war time captured is stunning and heartbreaking. The incidents Billy and his mates are facing is sad and unavoidable. But in the end, what Billy and all of us will learn from it is that we don’t chose our citizens to defend. As for a soldier, its duty is to protect the country without looking into the amount of bad people the country itself might have. To conclude that, it’s safe to mention that a young and a first-time actor Joe Alwyn is simply amazing. By looking at him you can simply understand why the country still stands on its feet. Kristen Stewart who might not have enough of screen time still contributes significantly, whose affection and love for her brother is so great which, by looking at both actors, you can’t really deny. Overall, the movie itself is splendid and insightful. It has no scenes that would bore any viewer, while the brotherhood being displayed at its best. This is why to watch movies like Billy Lynn’s Long Halftime Walk is an absolute joy, even though it’s sad and cheerless.